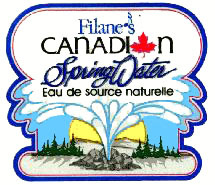 Filane's Canadian Spring Water quenches your thirst and leaves no aftertaste. Nothing tastes as naturally refreshing! We've Passed the Taste Test! In Northern Ontario, there is a geological formation known as the Precambrian Shield. During the most recent of the ice-ages beginning about 2.5 million years ago ice sheets covered the region stripping away soil and exposing 570 million year old rock. Under that rock we have released water which has been trapped for over 570 million years. This area is one of the few places in the world where clear, natural Spring Water can be found. Filane's Canadian Spring Water is located in the heart of this area from a well that is 166 feet deep. Filane's Canadian Spring Water makes every effort during the bottling of this product to ensure that the quality is maintained until it reaches the customer. The water source has serviced the Filane's Fallen Rock Motel, Restaurant & Resort for twenty years. Local people had come over the years to fill their personal containers from the source. Water bottling started eight years ago and is natural, unaltered and bottled directly at the source. Public Health Department testing of the water is conducted on a regular basis with positive results every time. Bottled water is regulated as a food product and therefore must meet regulations established by Health Canada as well as laws set out by provincial and municipal governments. Travelling west: (Hwy. 11/17) Thunder Bay, Dryden, Kenora, Sioux Narrows and Fort Frances. Travelling east:(Hwy. 11/17) White River, Wawa, Sault Ste. Marie, North Bay, Sudbury, Parry Sound, and Oakville. (Hwy. 11) Longlac, Geraldton, and Cochrane. We have been proud to service the communities and stores of many first nations, such as Pic Mobert and Pays Plat First Nations. We are now available in Winnipeg and surrounding area. For orders in the Winnipeg and the Manitoba area, please contact our sales rep Tony Condello.